Mike Vegas of Nice Rack Canada (formerly Nice Rack NYC) built that board for Annie. The MasterMind provides switching for the analog pedals and the Eventide Pedals take program change, tempo, and MIDI CC [Control Change] through some midi jacks on the side. Toronto, feel NYC envy no more – some Maple Leaf pride for you, courtesy Nice Rack Canada. Sure enough, you can read up on all the details on the Nice Rack NYC blog, complete with loads of photos. A week later Annie picked up her new rig comprised of a Z Vex Mastotron, Death By Audio Interstellar Overdrive, Boss Super Shifter, Eventide PitchFactor & an Eventide Space. The effects are wired in True Bypass Series, Routing via a RJM Music Mini Effects Gizmo, controlled by a RJM Music MasterMind. Voodoo Lab Pedal Power 2 Power Supply. 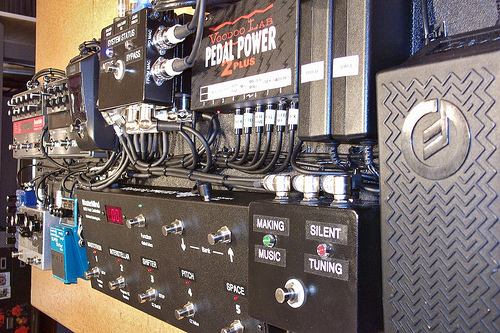 Custom System Interface, Silent Tuning Option & Tap Tempo Switch by Nice Rack NYC. Annie re-purposed a Moog Expression Pedal that she liked the feel of. The Mastermind is a beautiful MIDI foot controller for around US$300. Eventide has St. Vincent herself walk you through all their tasty effects in the video at top. It’s terrific hearing her insights into these sounds, though someone went a little crazy with the filters in Final Cut, it seems. Thanks, everyone, for filling in the details. That should provide plenty of inspiration for artists getting their footboards together – and to hit the practice rooms hard, too.